When the Milwaukee Brewers played in Pittsburgh this week, they ended up staying at the same hotel as a Furry Convention. (It's actually the Furry Convention.) That's Bob Uecker and one of them above. 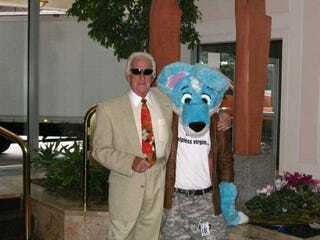 The notion of the Milwaukee Brewers hanging out in the same hotel as Furries might seem funny to you, but not to Brewers broadcaster Jim Powell. Virtually everyone, even those who looked otherwise "normal", had a tail sticking out of their clothes in the back. Players and staff reported neighboring rooms generating loud animal noises, barking and other, deep into the night. At first it was kind of funny to see these people wandering around the downtown streets and filing into the hotel, but after the novelty wore off it just made everyone feel creepy. The "furries" seem harmless enough, but people who think they might be an animal trapped in a human body just are unnervingly odd, to say the least. Perhaps this is why the Brewers struggled so much in Pittsburgh this week; it can be difficult to sleep when you're hearing howls of Furries all night. It can be difficult to sleep just thinking about it now, actually.